The video ends with a picture of Jerusalem and the words: "Arab Jerusalem." Abbas made the speech at a Fatah event and the video, which Abbas' PA TV edited into a version showing only the implicit call to violence, was already broadcast that same evening right before the PA TV evening news. For three days, the video that promoted violence to prevent Jews from defiling the Al-Aqsa Mosque was broadcast 19 times as Arab rioting in Jerusalem increased. A three-month-old Israeli baby and a young woman were killed in a terror attack in Jerusalem and one Arab youth was shot and killed by Israeli soldiers as he was attacking Israeli cars with gasoline bombs. Using common PA duplicity, Abbas is promoting violence while at the same time warning the world about impending violence, so he can claim innocence. "Message to our people in Jerusalem: Tomorrow you should all wear black clothes so that the occupation forces cannot identify young people by the color of their clothes and arrest them later." 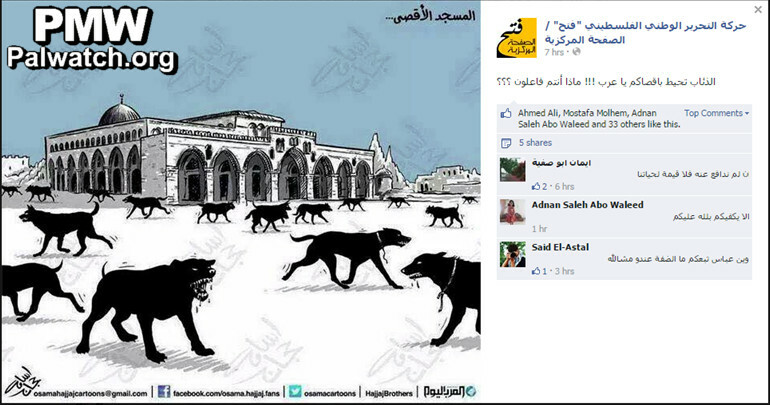 This is not the first time that a Palestinian leader called on his population to defend Al-Aqsa. When Yasser Arafat wanted violence against Israel he likewise defined Israeli presence on the Temple Mount as defiling the Al-Aqsa Mosque. Arafat's call to defend Al-Aqsa when Israeli MP Ariel Sharon visited the Temple Mount, similar to Abbas' call today, led to extended Arab rioting in October 2000, which escalated into what Palestinians call "the Al-Aqsa Intifada." The PA's five-year terror campaign that started with riots to "defend Al-Aqsa" left 1,200 Israelis killed, mostly from suicide bombings. Twice Abbas' PA TV has broadcast a documentary film on Jerusalem in which Jews praying at the Western Wall are called "sin and filth," as exposed by Palestinian Media Watch. 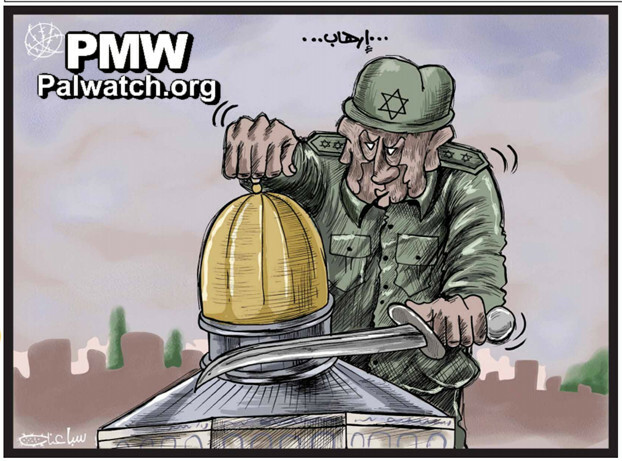 Click to see additional examples of PA and Fatah's demonization of Jews and the claim that Israel is endangering the Al-Aqsa Mosque to build the "alleged Temple".